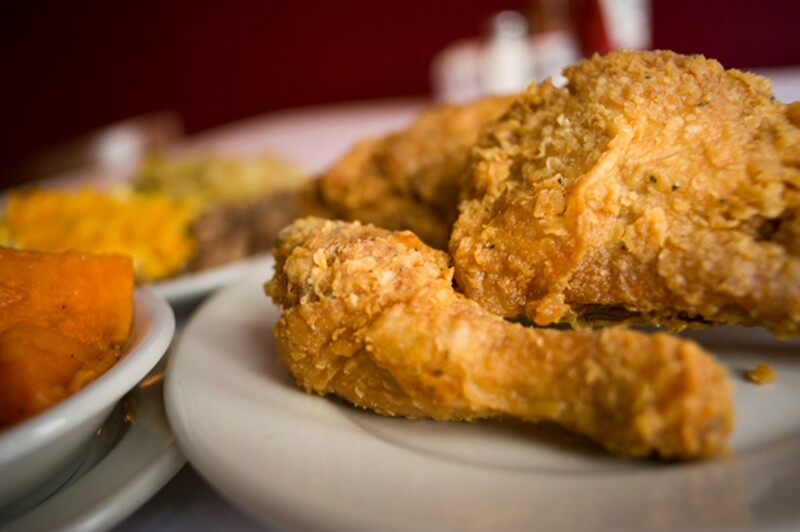 For those willing to wait, Southern Cafe serves stellar fried chicken and other soul-food classics. The fried chicken lives up to the hype. Hours: Wed.-Sat. 11 a.m.-9 p.m., Sun. 1-8 p.m. When I started digging into Oakland's soul food scene a few years ago, Southern Cafe was one place that kept coming up — in every "Best Of" list, every Google or Chowhound query. 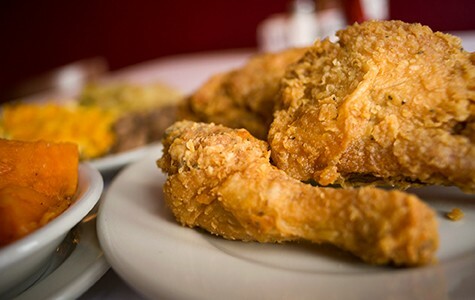 Folks would speak in hushed, reverential tones (or so I imagined) about the flaky-crusted, buttermilk-soaked fried chicken and the friendly, down-home atmosphere. Alas, the restaurant closed in 2008, amid wailing and gnashing of teeth. For a while another soul food restaurant, The Bay Leaf, occupied the space — which is located on MacArthur Boulevard, in the Dimond district — but when that, too, closed, the sisters who had run Southern Cafe approached the building's owner, recently retired firefighter Phillip Bell, with a proposal for him to invest in the space and bring their beloved restaurant back from the dead. So, under Bell's ownership, Southern Cafe reopened last April. Deimentrius Clay, the former chef-owner, still presides over the kitchen, joined by her sisters Maralena and DeeDee. Although I never had a chance to eat at the previous incarnation of Southern Cafe, after two recent visits to version 2.0, I can say with confidence that the restaurant is back with a vengeance, serving the kind of old-school soul food that'll clog your arteries and inspire sweet hosannas. Perhaps the best reason to visit is a new feature: a lavish all-you-can-eat buffet on Sundays. The spread includes six meat options and every side dish on the menu, plus a couple of sides not always offered during the week — including a goopy cornbread dressing. The $21.95 price of admission ($11.95 for kids) includes dessert and all the fountain soda, iced tea, and mimosas (!) you can drink. Pay extra if you want beer, wine, or lemonade. Only a sucker goes to a buffet without some kind of strategy, so here's what you need to know: While diners can go up to the line as many times as they please, you're restricted to two meats and four sides per plate, and an employee ladles out the food, making it difficult to control portion sizes. Determined carnivores might consider limiting themselves to just one or two sides per pass, in the interest of saving stomach space for, say, more fried chicken. Speaking of which, the chicken lived up to the hype, a nicely seasoned, craggy crust and succulent, juicy meat. The pleasures of eating chicken like this are simple — the crunch of the batter, the taste of hot fat as you rip apart flesh. Likewise, the cornmeal-crusted fried catfish — airy, well seasoned, grease-free — was some of the best I've had. For something off a buffet table, it was nothing short of miraculous. Both fish and chicken seemed calibrated to achieve maximum deliciousness with the application of just a few drops of Crystal hot sauce (available at each table). All of the food had an appealing home-cooked quality. I enjoyed the rich, gravy-soaked meatloaf. Even the baked chicken — so often a throwaway option for the health conscious — was perfectly tender, and had soaked in the savory flavor of a simple braising liquid. Still, it's tough to adhere to such a meat-oriented strategy when the sides are as good as they are. At Southern Cafe the vegetables have just as much love lavished upon them as the meats — although, to be fair, nearly every vegetable dish has some meat component. Indeed, the Clay sisters are skilled at extracting flavor from the humblest ingredient — whether that's the smoky, well-spiced red beans or the chowder-y corn sautée (made with frozen corn). Even soggy canned green beans benefitted from a dash of chili flakes and an infusion of smoked-meat savoriness. Perhaps my favorite bite was the boiled cabbage, which had been cooked until the leaves went limp and became wonderfully sweet, with bits of smoked turkey that added both flavor and textural interest. The only real disappointment was the mac 'n' cheese, which was neither oozily decadent nor toothsome and crisp-edged. One of the biggest virtues of buffet service, of course, is that you get to start eating almost immediately. If you go for dinner at Southern Cafe on any non-buffet day, every dish will be cooked (or at least reheated) to order. On a recent Wednesday night, when the dining room was filled to one-third of its capacity, the service was so painfully, tragicomically slow that we considered cutting our losses and just going home. It took twenty minutes for two glasses of lemonade to come out. By the time the food arrived, nearly an hour had passed. When we finally started eating, the food was tasty enough, and portioned generously enough, that (almost) all was forgiven — though it should be noted that we were so famished at that point, we inhaled it all in ten minutes flat. The fried chicken was slightly better than it had been at the buffet, if only because it was served piping hot. An order of oxtails, which Bell said is the restaurant's second most popular dish, was simple and satisfying — drenched in beef gravy and prepared in a way that emphasized the gelatinousness of the cut. They're best enjoyed if you just pick up the bones and dig in. And buttery corn muffins, warmed in the oven, were better than the buffet table's sticky-sweet cornbread squares. But was the food good enough to be worth the hassle? Certainly, if you want quick gratification, dinner at Southern Cafe probably isn't the best choice. My inclination would be to place your order to go (well in advance) or to come during an off-peak hour. Or, to play it safe, you might just stick to the Sunday buffet.